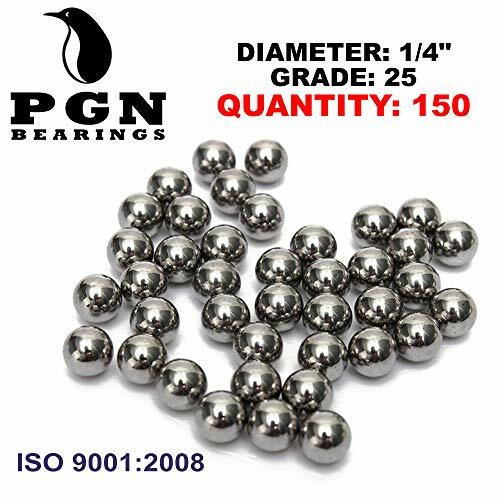 Quantity per Package: 150 Pcs Grade: 25 Material: Chrome Steel (AISI 52100) Diameter: 1/4 , 0.25 inches (6.35 millimeter) Weight: 0.03601 ounces (1.021 grams) PGN's G25 1/4" Chrome Steel Balls extremely precise and smooth surface guarantees you won't find any defects, such as flats, pits, soft spots, and cuts. Model: R4 2RS Quantity per Package: 10 Pcs Material: 100% Chrome Steel Protection: Rubber Seal on both sides Greased / Lubricated: Yes Bore (Inner) Diameter: 1/4" Outer Diameter: 5/8" Width (Thickness): 0.196" Supported Revolutions per Minute (RPM): 38,000 PGN's R4RS (1/4"x5/8"x0.196") is a single-row bearing that supports radial loads, made with Chromium Steel providing superior quality and durability. It comes pre-lubricated and shielded to keep the lubricant in and contaminants, dirt and debris out. 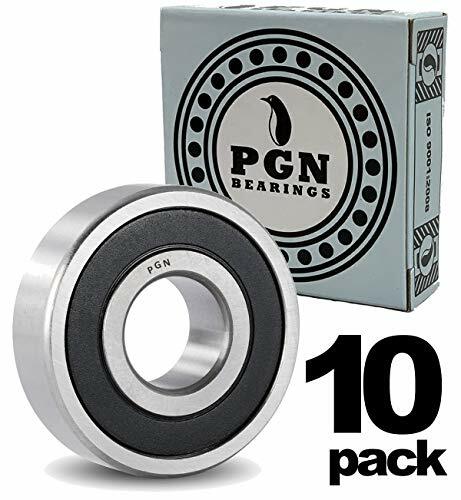 Quantity per Package: 500 Pcs Grade: 25 Material: Chrome Steel (AISI 52100) Diameter: 1/4 , 0.25 inches (6.35 millimeter) Weight: 0.03601 ounces (1.021 grams) PGN's G25 1/4" Chrome Steel Balls extremely precise and smooth surface guarantees you won't find any defects, such as flats, pits, soft spots, and cuts. 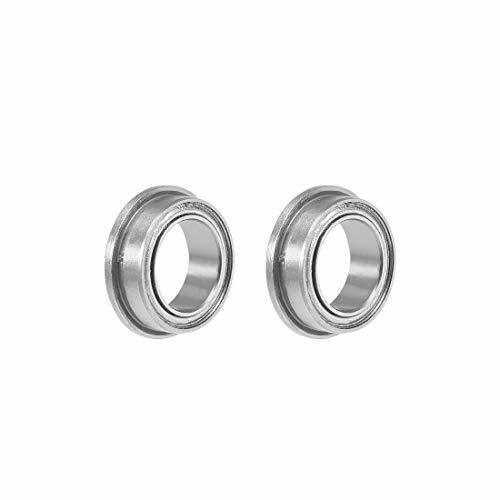 Quantity per Package: 1000 Pcs Grade: 25 Material: Chrome Steel (AISI 52100) Diameter: 1/4 , 0.25 inches (6.35 millimeter) Weight: 0.03601 ounces (1.021 grams) PGN's G25 1/4" Chrome Steel Balls extremely precise and smooth surface guarantees you won't find any defects, such as flats, pits, soft spots, and cuts. 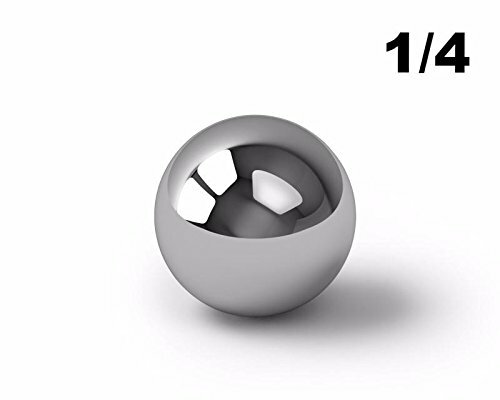 Standard Diameter: 1/4" / .25 InchesMetric Diameter: 6.35mmGrade: 25Material: AISI 52100 Chromium SteelBall Weight (each): .036897 Ounces / 1.046 GramsChrome steel balls offer the precise geometry and fine surface finish that makes them especially useful for bicycles, casters, drawer slides, door locks and many other applications. Model: R4 ZZ Quantity per Package: 2 Pcs Material: 100% Chrome Steel Protection: Metal Shield on both sides Greased / Lubricated: Yes Bore (Inner) Diameter: 1/4" Outer Diameter: 5/8" Width (Thickness): 0.196" Supported Revolutions per Minute (RPM): 38,000 Dynamic Load Rating: 1489 N Static Load Rating: 618 N PGN's R4z (1/4"x5/8"x0.196") is a single-row bearing that supports radial loads, made with Chromium Steel providing superior quality and durability. It comes pre-lubricated and shielded to keep the lubricant in and contaminants, dirt and debris out. 1.5 ounces of each of the following sizes mixed in one bag for a total of 12 ounces:1/8", 5/32", 3/16", 7/32", 1/4", 5/16", 3/8", 1/2". 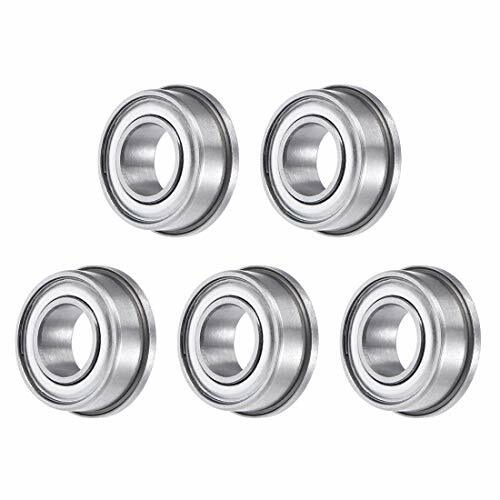 Bearing Buddy Bearing Protectors provide protection against damage from water and dirt entering the wheel bearings and make lubricating bearings a snap. Bearing Protector Model No. 1781. Bra Model 17B. Chrome plated. For use with 1.781" (45.24 mm) hub bore. Outer Bearing Cone: LM-11949. Outer Bearing Cup (race): LM-11910. 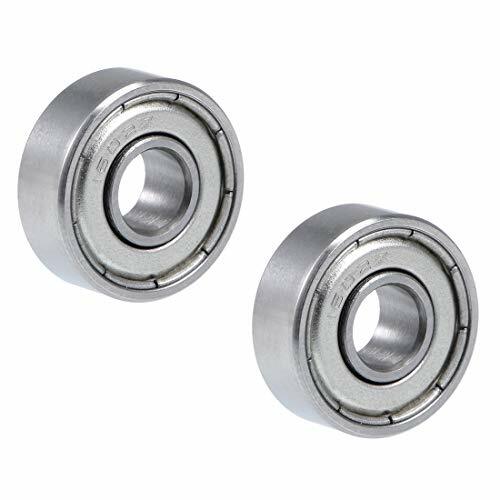 1.Deep Groove Ball Bearings are one of the most widely used rolling bearings. They are used to accommodate radial and axial loads in both directions2.Suitable for all kinds of industrial equipment, micro motor, small rotary motor, office equipment and so on.3.With small friction and high-limit speed, Uxcell Deep Groove Ball Bearings are cost-effective and require little maintenance.4.Chromium Steel (GCr15) made with heat treating, provides high and uniform hardness, good wear resistance, and high contact fatigue performance.5.Single-row, pre-lubricated, normal accuracy.Selection Guide:Shields (Designation Suffix Z/ZZ) - High speed. Protect from dirt and debris.Non-contact seals (Designation Suffix RZ/2RZ) - Made of sheet steel reinforced NBR (oil- and liquid-resistant). Provide better sealing effectiveness than shields. Can be operated at the same speeds as shields.Contact seals (Designation Suffix RS/2RS) - Made of sheet steel reinforced NBR (oil- and liquid-resistant). Lower limit speed than Shield Bearings.Specification:Model: 6000-2RSSealed Type: Single SealedCage Material: Stamping SteelInner Diameter (d): 10 mmOuter Diameter (D): 26 mmThickness (B): 8 mmDynamic Load Rating (Cr): 4.58kN Static Load Rating (Cor): 1.98kNAccuracy Class: P0 (ABEC-1)Number of Pack: 10 PcsWeight: 183g For CALIFORNIA residents only: WARNING: This product contains chemicals including DEHP, which is known to the State of California to cause cancer and birth defects or other reproductive harm.Please note that by posting this Proposition 65 warning, we are notifying you that one or more of the Proposition 65 listed chemicals may be present in a product. With Unique Bargains' products, the exposure to these chemicals may be of no significant risk to you, but out of caution, we have elected to place this warning on our site to make sure our customers are informed.You can find more information at http://www.oehha.ca.gov/proposition-65/about-proposition-65. Cooking for crowds can be easy and fast with the Cuisinart Custom 14-Cup Food Processor. Made from brushed stainless steel, this sleek kitchen workhorse is a breeze to use and is designed to whir through prep and cooking with ease. Whether you're making a weeknight meal or dishes for a weekend celebration, this large capacity stainless steel food processor can handle it as the 720-watt motor makes quick work of chopping whole fruits and vegetables, shredding cheese or kneading dough. It has a large pusher so you can put large pieces in smoothly. This Cuisinart food processor is made with a detachable disc stem that makes it simple to clean. It comes with a recipe book so you can try out a variety of dishes. With a chopping and mixing blade, you can cut your foods appropriately. The Cuisinart Custom 14-Cup Food Processor makes a handy gift for a new homeowner with its versatile design. 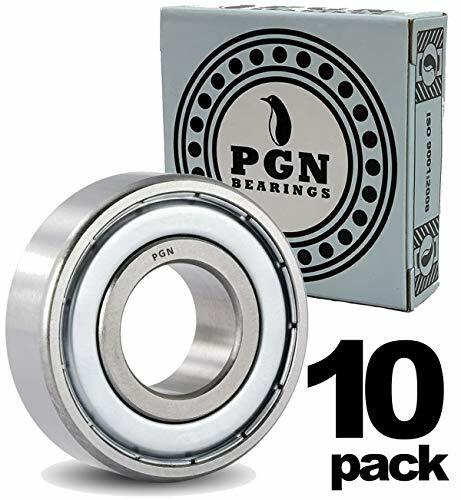 1.Deep Groove Ball Bearings are one of the most widely used rolling bearings. They are used to accommodate radial and axial loads in both directions2.Suitable for all kinds of industrial equipment, micro motor, small rotary motor, office equipment and so on.3.With small friction and high-limit speed, Uxcell Deep Groove Ball Bearings are cost-effective and require little maintenance.4.Chromium Steel (GCr15) made with heat treating, provides high and uniform hardness, good wear resistance, and high contact fatigue performance.5.Single-row, pre-lubricated, normal accuracy.Selection Guide:Shields (Designation Suffix Z/ZZ) - High speed. Protect from dirt and debris.Non-contact seals (Designation Suffix RZ/2RZ) - Made of sheet steel reinforced NBR (oil- and liquid-resistant). Provide better sealing effectiveness than shields. Can be operated at the same speeds as shields.Contact seals (Designation Suffix RS/2RS) - Made of sheet steel reinforced NBR (oil- and liquid-resistant). Lower limit speed than Shield Bearings.Specification:Model: 6001ZShield Type: Double ShieldCage Material: Stamping SteelInner Diameter (d): 12 mmOuter Diameter (D): 28 mmThickness (B): 8 mmDynamic Load Rating (Cr): 5.1kN Static Load Rating (Cor): 2.38kNAccuracy Class: P0 (ABEC-1)Noise Level: Z2Number of Pack: 10 PcsWeight: 209g For CALIFORNIA residents only: WARNING: This product contains chemicals including DEHP, which is known to the State of California to cause cancer and birth defects or other reproductive harm.Please note that by posting this Proposition 65 warning, we are notifying you that one or more of the Proposition 65 listed chemicals may be present in a product. With Unique Bargains' products, the exposure to these chemicals may be of no significant risk to you, but out of caution, we have elected to place this warning on our site to make sure our customers are informed.You can find more information at http://www.oehha.ca.gov/proposition-65/about-proposition-65. 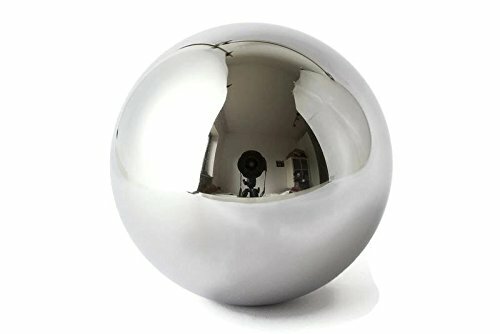 10 Diameter Chrome Steel Bearing Balls 11/32"